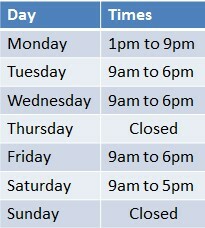 injuryclinic.ie is open 24 hours a day 7 days a week. our practice office on the other hand is only slightly less hours as you can see below. To make an appointment simple email, call or sms and we will get back to you as soon as we can. Please understand that during treatment hours we will be busy treating other clients and may not be able to answer the phone so leave a message.